This Frozen Mississippi Mud Pie is easily one of my favorite desserts. I know I say that with just about every dessert I make but seriously, this pie is amazing. If you like ice cream, chocolate fudge, oreos, coffee flavored things, or ooey gooey-ness, then you too will love this pie. The combination of flavors and textures is unreal. This no bake, frozen ice cream pie consists of a thin cookie crust, hot fudge, a creamy delicious cool whip/coffee ice cream pie filling layered with more hot fudge, crushed oreos, another layer of ice cream and finally topped with a generous amount of, you guessed it – crushed oreos. I actually made this pie a little over a year ago and had it on here but the pictures were awful. Bad lighting, poor composition and shot with a small point and shoot camera without any editing. Sometimes a picture doesn’t do something justice, well the photos I had didn’t do this pie any justice. Now that I’ve taken my love of food to an even greater level by completely immersing myself in the whole food blogging thing, I just love this recipe so much that I felt it deserved a second chance. Or maybe I just really wanted an excuse to make this pie. So…let’s talk more about this pie. Besides it being completely perfect I also love it because it’s a little messy. When putting this pie together, you are going between hot fudge and then cold ice cream and also working with crushed oreos, so things are bound to get a little messy. That’s okay, it’s all part of the process. Messiness and ooey gooey-ness (← I’m pretty sure that’s not a real word but it works) is what makes this pie unique. 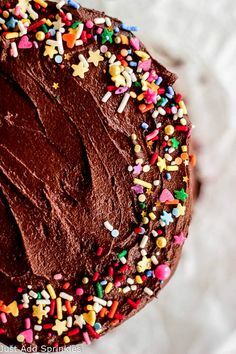 I will say that this is an easy recipe but it does require a little more time, some back and forth and a little patience when layering everything together. Just stick with it and I promise, the end result is perfect. When you are ready to get started, I suggest getting all your ingredients together; Oreos, butter, hot fudge, coffee ice cream and cool whip. Bring the cool whip and ice cream out of the freezer while you work on the other stuff so it will thaw a little bit, making it easier to work with. My first move would be to get your spring form pan out, crush your oreos and melt the butter. I highly recommend using a family sized package of oreos for this recipe. 20 cookies for the crust, 10 cookies for the second layer and 10 more for the top. Yes, that’s a ton of oreos and yes it’s completely necessary. If you don’t want a ton of oreos sprinkled on the top that’s fine, just use about 5 cookies in that case. You can probably get by with a standard package of these cookies but sometimes I buy a bigger pack just to avoid not having enough. Something else to mention, you’ll want to heat the hot fudge up so it’s not as thick and easily spreadable. And then we’re going to spread thawed ice cream over it. Messy..oh yeah. Looks messy…yes. Will it turn out right…you betcha. Keep in mind that while your working with hot and cold ingredients it’s going to be messy, blend together, not look right, etc. But once your done and the pie has time to freeze everything firms up and comes out great. I love how the crushed Oreo, coffee ice cream and hot fudge taste together. It truly is muddy goodness. 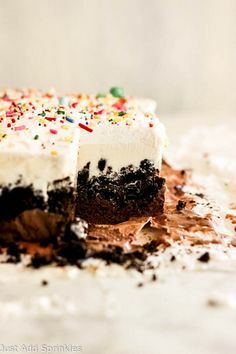 A delicious, messy ice cream pie that starts with a cookie crust and then layered with hot fudge, creamy coffee ice cream and more crushed oreos. Line the bottom of a spring form pan with parchment paper or spray with non stick spray. Set aside. Remove ice cream and cool whip from the freezer so it can thaw while you work. Melt butter in the microwave and pulse 20 Oreo cookies with a food processor until they resemble fine crumbs. In a small bowl combine crushed oreos and melted butter and mix together until combined. Crumbs should be completely covered and moist. Pour cookie/butter mixture into the spring form pan and spread it out evenly to form a cookie crust. This crust should just cover the bottom of the spring form pan, no need to work the crust up the sides, you just want a single layer, thin crust. Heat 1/2 cup of hot fudge in the microwave for about 30 seconds. Set aside. In a separate, larger bowl combine the entire tub of cool whip and ice cream and mix on high speed for about a minutes or two until the cool whip and ice cream is thoroughly combined. Pour heated hot fudge over the cookie crust and spread it out with a spoon. Spoon about half of the ice cream over the hot fudge. Your ice cream will start to melt and be runny, just keep smoothing it out over the hot fudge until it looks like it covers the crust. Stick the spring form pan in the freezer for about 10-15 minutes to firm up. Place ice cream in the refrigerator to avoid it melting completely. While the pie is freezing, you can crush 10 more oreos and heat the remaining 1/2 cup of hot fudge. Take the pie out of the freezer & ice cream out of the refridgerator. Layer on the hot fudge and crushed oreos. The pie will start to melt again but that’s okay. Layer on the rest of the ice cream on to the crushed oreos. Everything will start to blend together and look like a big mess but this is fine. Pulse remaining oreos (5 to 10 cookies) and sprinkle them on top of the pie. Place the pie in the freezer for at least 6 hours or over night to freeze . When ready to serve, take pie out of the freezer and allow it to thaw for about 10 minutes before releasing the latch on the side of the spring form pan and lifting up the side pan. 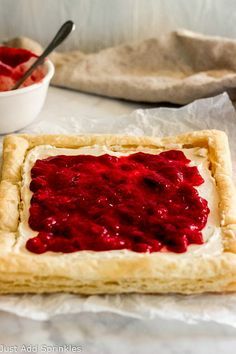 Cut pie into slices and serve. Any leftover pie should be returned immediately to the freezer.